This rugged Quick-Connect™ power assembly uses our flame and heat resistant Super-Trex® Type W Power Cable; a superior first line of defense against cutting, tearing, abrasion, and impact. 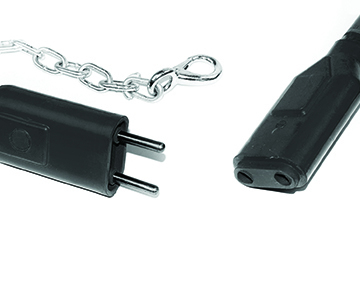 The standard pin and sleeve configuration is interchangeable with most standard connectors now in use, but the rubber collar molded at the base of the male pins forms a "cork seal" when plugged into a matching unit from TPC Wire & Cable Corp. This seal reduces carbon arcing and protects against dust and liquids. SUPER-TREX® TYPE W POWER CABLE — Superior first line defense against cutting, tearing, abrasion and impact. Extreme all-weather flexibility. Flame and heat resistant. 100% TRANSFER MOLDED TSE PLUG AND CONNECTOR BODY — “No pressure” process prevents induced stresses. Body integrity and complete bonding mean longer life. RUBBER COLLAR MOLDED AT BASE OF MALE PINS — Forms a “Cork Seal” when plugged into a TPC matching unit. Provides dust and liquid protection and reduces carbon arcing. ROTATING SAFETY CHAIN COLLAR — Bearing action will not cut through cable when twisted or flexed. STANDARD PIN AND SLEEVE CONFIGURATION — Interchangeable with most standard connectors now in use. BRASS PINS AND CONTACT SLEEVES — Ensures a positive electrical connection.